Tángalo returns to Camelot in full force with their sextet tango 'Orquesta Tipica'. 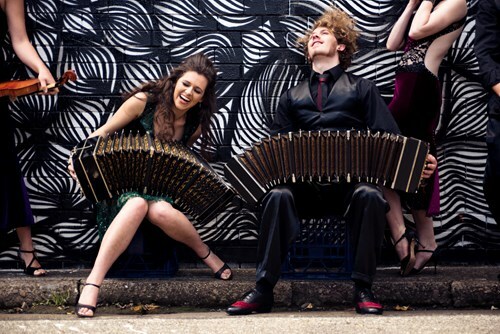 One of Australia's foremost Tango ensembles, Tángalo is a shape shifter on the scene, from duo to full symphony orchestra and everything in between, whatever guise the ensemble chooses, the music of the Argentine Tango is presented with skill, craft, passion, joy and grit. Described by Sydney Morning Herald's John Shand as 'Chamber Music on Steroids', this is a Thursday night you don't want to miss! With Emily-Rose Sarkova and Owen Salome at the helm on Bandoneons, Susie Bishop bring her soulful violin and voice which is always a favourite. Tango double bass powerhouse Chloe Anne Williamson will be flying in from Queensland, Amy Putt has returned from New Zealand to take her place at the piano and a special guest is joining on the viola. Festival favourites at the National Folk Festival, The Adelaide Festival and Bellingen Music Festival, this group has toured extensively throughout Australia as well as the homeland of Tango - Argentina amd collaborated with many brilliant Tango artists such as Latin Grammy nominees Duo Ramirez Satorre and Uruguayen bandoneonist Nestor Vaz. They also featured at the biggest Tango Festival of Australia in 2017, the Australian Tango Festival, playing with Argentine Tango champion performances. Bring your dancing shoes and listening ears to a night of truly beautiful music.